When you are expecting a baby, a bunch of things run through your mind. Among millions of things you check off your list of essentials for your precious little bundle are diapers. One big decision that is usually overlooked is which route you may choose to diaper your baby. Most people automatically assume disposables and ask you "are you going to use Huggies or Pampers?" There is an option that more parents are considering: cloth. Some people get discouraged with all the negative feedback from people (and believe me, there is a lot!). Some people buy a few cloth diapers but for various reasons, end up using disposables and many others try cloth diapers and absolutely love them! When I was pregnant everyone (who was interested in buying something to help us with our new baby) would ask me, "What brand of diapers are you going to use?" When I would respond with, "I’m going to use cloth diapers." They would not only be shocked (and give me that look), but they would give me their (extremely) unwanted sarcastic remarks: "Good luck with that…", "We will see how long that lasts. ", or "You’re actually going to wash those gross diapers?" Little did I know at the time, you are supposed to dispose of solid waste the same way for disposables as you must for cloth diapers; by dumping it in the toilet before washing or throwing the diapers away. If waste is thrown in the landfill, it can get into, and contaminate, our drinking water. That would have been a great comeback to those numerous snide remarks I had received. Remarks aside, I wanted to, and was determined to, use cloth! 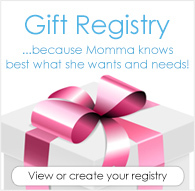 The price to get started was a bit hefty, but I found out I could create an online registry for them - just like I created a baby registry for everything else. Not only was I extremely excited, I was relieved too! I now had the power to put every type of diaper I could want on this registry and let our friends and family know. I thought this was great news for our baby shower. I honestly believe that people are scared of cloth diapers, because we did not receive all the diapers we had put on our gift registry. On the flip side, I did not register for any disposables and we received several large boxes. The good thing about the disposable diapers we received is I returned them and used the money to purchase more cloth diapers! Wow! I've never had anyone say such rude things! That's terrible! And I didn't know that poop can contaminate our drinking water. But at our local landfill they burn everything, so I don't know how that would be different.